Instructor Jobs In Sports Industries Development Centre - SIDC In Sialkot was published in Khabrain Jobs on 11 Feb 2019. As per Instructor Jobs In Sports Industries Development Centre - SIDC In Sialkot details, there is a Contract Basis job in Sports Industries Development Centre - SIDC for job seekers those have B.sc qualification. 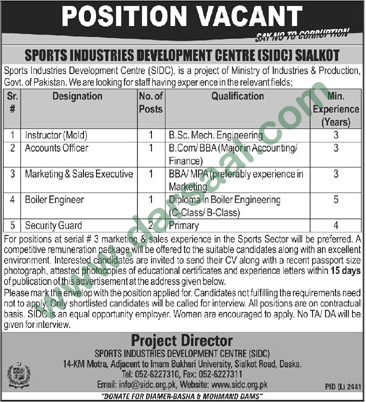 Last date to apply for Sports Industries Development Centre - SIDC jobs in Sialkot on B.sc qualification for Instructor jobs is 25 Feb 2019. Working hours for Instructor in Sports Industries Development Centre - SIDC are 8 Hours a day and 40 hours a week. Instructor job is related to Government Industry Jobs. You can view more jobs published today 11 Feb 2019, jobs in Khabrain, Sialkot jobs, Jobs for B.sc qualification, Contract Basis similar to Instructor Jobs In Sports Industries Development Centre - SIDC In Sialkot.